A newly installed portion of the platform at the Elizabethtown Train Station opened this month, serving Amtrak riders who are headed north to Harrisburg. 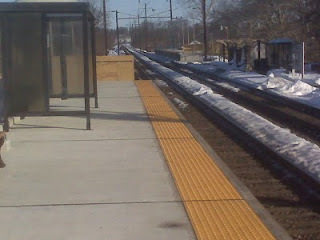 The platform is now raised off the ground, meaning that riders no longer will have to use a step stool to enter trains. And those using wheelchairs will be able to roll right onto the trains. Borough Manager Roni Ryan reported that the contractor, Lobar Construction, expects to have a portion of the southbound platform open at the beginning of March. 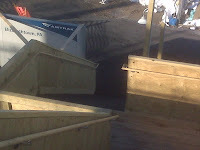 Until the project is complete, riders access the platforms via temporary stairs that have been built on either side of the tracks. The old stairs in the tunnel are closed and will be renovated and reopened. On both sides, the platforms will eventually be extended so that entire trains can stop and riders board at any door on the trains. In the meantime, and especially during the winter, work has continued on the train station building, including safe removal of asbestos and other hazardous materials. At a recent Borough Council meeting, council members discussed what kind of use might occur in the station once the project is completed. Council and borough officials are open to creative ideas. Elizabethtown received $9.3 million in federal stimulus money through the American Recovery and Reinvestment Act for the project. Borough officials had been working and planning for the project for more than 10 years. Have really been enjoying the new platform.